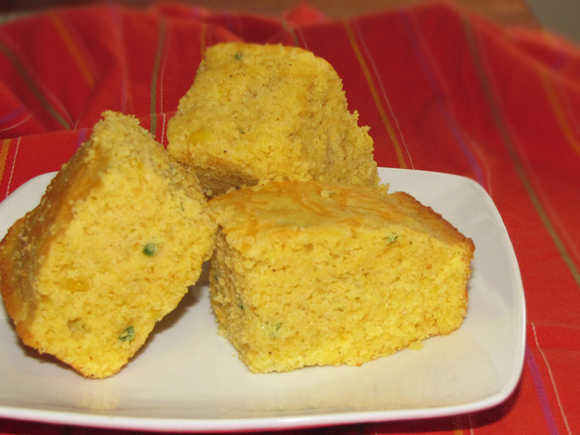 Years ago, I decided it was time to create my own cornbread recipe. I tried so many versions by other people but I just couldn't find one that I liked. I wanted more cornmeal flavor and none of them were up to par. It seemed like all the ones I've made before were just too floury and didn't even deserve the cornbread name! As the years went on, I'd write a new recipe here and there, but I was never 100% happy with it - it was either too dry or didn't have enough flavor. The other day, I made one that I finally love. It came out of the oven really moist and with a lot of flavor thanks to the cheddar cheese and the jalapeños. The jalapeño was subtle so you could add more if you want a bit more heat or you can even leave it out completely if jalapeños aren't your thing. 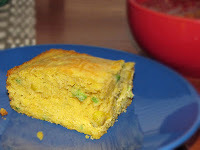 This cornbread was a big hit with the boys and it was perfect with my Crock Pot Mexican Chili (coming soon). I might make it again for my next batch of stew or it would even go with a nice, hearty soup in the coming months! 2. Mix first five ingredients together in medium-sized bowl. 3. Whisk eggs, sugar, milk, oil, and melted butter together in separate large bowl. 4. Add cornmeal mixture to wet mixture in batches. Mix well after each addition. 5. Mix in 3/4 c of the shredded cheese, the jalapeños, and the corn. 6. Grease a 9"x9" non-stick pan and pour in the cornbread mixture. 7. Sprinkle remaining 1/4 c cheese on top and bake for 25-30 minutes or until toothpick inserted in center comes out clean.